A Press and Journal investigation has found that the Granite City’s cemetery, cremation and mortuary service has raked in a “surplus” of £6.4m in the last six years. Scottish Government figures show that the local authority – which was previously at the centre of the baby ashes scandal – made more than £1m in profit in four of the last five years, including almost £2m in 2015/16 alone. No other council in Scotland made more than £1m in any of the last six years – and almost two-thirds of authorities have been running the service at a loss in the period. The revenue-raising emerged just days after a series of new price rises came into effect in Aberdeen, including an 18% rise in basic burial charges, a 39% increase in purchasing a lair for a cremation casket, and a 54% increase in the cost of casket interment. Last night, the findings led to calls for a “serious review” at the council, amid warnings that it could be seen to be “profiteering” from the most difficult times a family can face. Concerns about rising levels of funeral poverty have been growing in recent years, and has led to an ongoing probe by the Competition and Markets Authority, and an action plan from the Scottish Government. The average price of arranging a funeral in the UK has risen for 15 consecutive years and now stands at £4,271, with much of the bill relating to the cost of burying or cremating a loved on. While Aberdeen’s fees are not the very highest in Scotland, statistics show that it is one of the only local authorities running the service at a significant profit each year. In 2017/18, the city council’s burial and cremation team spent just more than £1m, but at the same time it raked in an income of £2.3m. The £6.4m in profit in Aberdeen over the last six years compared to the £3.6m earned by the second and third highest authorities on the list, West Dunbartonshire and South Lanarkshire. Kristi Kelly, manager of Aberdeen Citizens Advice Bureau (CAB), said: “It’s disappointing to hear that Aberdeen City Council charge more for these services than it costs to carry them out. “Last year, more than 100 people came to Aberdeen CAB for advice regarding the death of a loved one, and they don’t need added stress at a time when they are already extremely vulnerable. Western Isles Council had an income surplus of £759,000 over the six years, but the service was subsidised overall in Aberdeenshire, Highland, Moray, Orkney and Shetland. Aberdeenshire Council, which runs more than 200 cemeteries and does not own its own crematorium, spent double the amount of Aberdeen City on it last year, and had the second largest losses in Scotland over the period, at almost £4.4m. After a series of controversial price increases, Highland Council made a surplus of £867,000 last year – the fourth highest in the nation – but had previously been running the service at a significant deficit for several years. Last night, opposition Liberal Democrat city councillor Martin Greig, whose ward includes Aberdeen Crematorium and Hazlehead Cemetery, said: “It cannot be right for the council to make significant profits from provision of bereavement services. Aberdeen Donside MSP Mark McDonald said: “Most people would expect that there would be expenses related to funerals, burials and cremations, but I think people would want to ensure that councils weren’t profiteering on the back of what is probably the most difficult time any family can experience. Conservative councillor Ryan Houghton, a member of the city’s ruling administration, said: “Spending has been trimmed in every area of service provided by Aberdeen City Council in recent years due to severe budget cuts from the SNP government. Higher charges for burial and cremation services were introduced by several councils across the north and north-east last week to help plug funding gaps. Fees had already increased across Scotland in recent years, by an estimated average of 77% since 2010, before the new prices came into effect. Aberdeen City Council has responsibility for 17 cemeteries and burial grounds, however lairs can now only be purchased at three of them. Dyce is the only city graveyard where graves can be bought in advance of death, while at Newhills and Hazlehead they can be purchased for immediate use. Meanwhile, the number of cremations each year at Aberdeen’s crematorium, which underwent a £1 million refurbishment in 2018, has remained at between 2,400 and 3,000 throughout the last decade. Last year, the local authority had the 12th highest fees among Scotland’s 32 councils for purchasing cemetery lairs, but was only the 25th highest for standard burial charges, and was also among the lowest for cremation costs. Since then, new changes which came into effect last week included inflation-only rises on many key services, and a 9% reduction in the cost of a “direct cremation”, whereby no chapel service is held. However, city councillors also agreed a series of higher price increases, including an 18% rise in basic burial charges to £680, as well as a 39% increase in purchasing a lair for a cremation casket, and a 54% hike in the cost of casket interment. Aberdeenshire Council, which runs more than 200 cemeteries, had one of the top 10 highest fees in Scotland for lair purchase last year at £881, and it has now risen by 11% to £979. Basic burial costs have increased by the same proportion in Aberdeenshire to £855. In Moray, sale of a lair increased from £697 to £770, while a new additional charge for burying non-Moray residents was also agreed, in a similar arrangement to that which already existed in Aberdeenshire and Shetland. Inflation-only rises for burials, lairs and cremations were agreed in Highland, meanwhile. Standard fees at Inverness Crematorium had already more than trebled over the last 20 years, and now sit at £931 with use of the chapel, while charges for interment fees for cemeteries have doubled since 2010/11, and now also at £931. 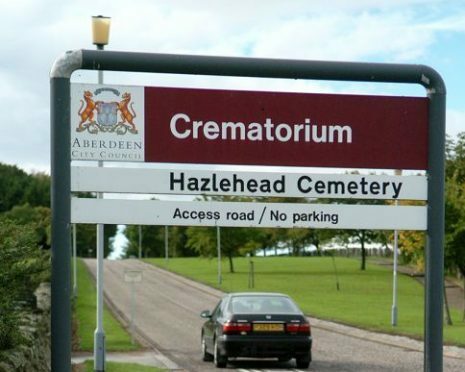 Aberdeen Crematorium has hit the headlines during the baby ashes scandal. All crematoriums in Scotland now face tighter rules after a major review in the wake of the controversy. It emerged in 2013 that at least 250 dead babies cremated at Mortonhall Crematorium in Edinburgh were buried in secret. And in Aberdeen, it was revealed that baby and adult ashes were routinely mixed together at the crematorium – with parents often told that infants did not produce ash – and the remains not returned to families. An audit by Aberdeen City Council found up to 40 babies’ ashes may have been scattered in Hazlehead’s Garden of Remembrance without families being consulted. Bereaved parents were horrified at the revelation and demanded action be taken, which eventually led to both the crematorium’s manager and council infrastructure director losing their posts. New reports on the crematorium have found much improvement and the city council commissioned a permanent memorial in nearby Hazlehead Park to those affected. In Edinburgh, the scandalous disposal of ashes took place for more than four decades, meaning hundreds of parents will never know the final resting place of their children. It made 64 recommendations, which were all accepted by the Scottish Government.